Southwest Oklahoma’s weather does enough to run up our heating and cooling bills, so any other opportunity to lower the utility bills is worth looking into. For many homes, tankless water heaters provide not only energy savings but also greater convenience. Conventional storage tank systems hold water in a large tank and constantly draw energy to keep the water warm at all times. Because the tank inevitably gives off some heat, it’s constantly wasting energy. Once you use up the hot water in your tank, you have awhile for more to heat up. A tankless system draws water and simultaneously heats it when you turn on the tap. No hot water is stored, which eliminates the energy waste caused by a tank. The system will heat water as long as you have the hot water tap on, so you’ll never run out. The amount of hot water you get at one time is limited only by the system’s hot water flow rate, measured in gallons per minute (gpm). This is why tankless water heaters must be sized carefully in order to perform as intended. One large tankless system can be used to supply hot water for the whole house, but this works best in smaller, one-story houses. In a large house with only one system, it can take a few minutes for the taps and appliances farthest from the system to get hot water. Multiple point-of-use systems provide hot water faster and more efficiently. You might install one for the bathroom to supply the shower and sink, another in the kitchen for the dishwasher and sink, and a third in the laundry room. 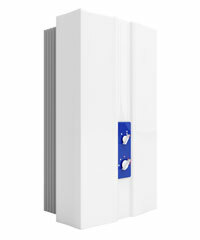 For more information on tankless water heaters, contact Davis Air Conditioning, servicing southern Oklahoma. Posted on May 12, 2015 by D Custom.